I'm only preparing and painting the castings as I need them. This will save the paint getting chipped. The 2 bits of trunking are supposed to but up against No 3 funnel. Therefore I'm going to save these until after the funnel is fitted. Here is the bow anchor well masked and painted. This is the first of the 1x1mm strips fitted. I actually has to cheat a little. Because the bulwarks finished almost at the bulkhead, I trimmed back the deck slightly and thinned down the strip. Now the end of the strip is flush with the top of the bulwark. These pesky little vents are very fiddly. It took ages to file the mould marks off them. To make it easier to paint and fit them I've drilled them out with a 1mm hole and fitted some 1mm brass pegs which are just Super-glued in place. 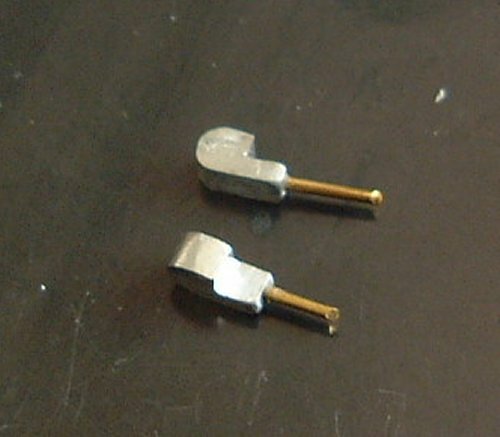 It's a fiddly job, and you'll need a small vice to hold them, a sharp 1mm drill, and you'll have to be very careful to get the drill central so you don't drill through the sides, but it is possible. A sharp centre punch to mark the hole position is needed as well. 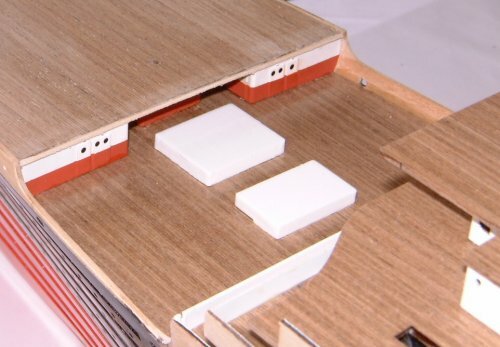 Here is an easy way to get the cast parts in the right place without trying to measure the deck and mark the positions which may spoil your deck. Take a sheet of white paper and rub your finger along the edge to mark the rear and side edges. Cut along the rear, and draw the edges in, in pencil. Now fold it in half to mark the centre line. 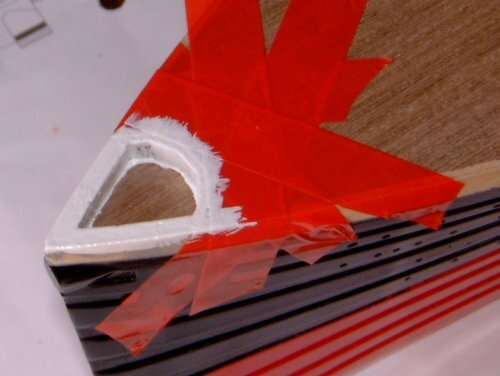 For larger parts like the bollards, you can mark cutouts, using the dimensions given in the instructions, tape the template in place with masking tape and then use this as a guide to glue the parts in place. Be careful not to glue the paper down as well. 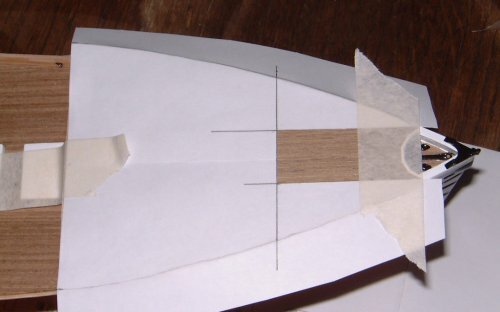 For smaller parts, mark the position in pencil and tape the template in place again. 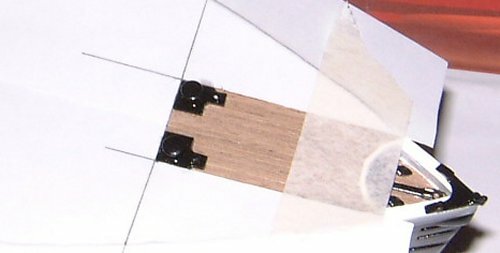 You can then just push a needle through the paper and it will leave a small hole in the deck, just enough to see where to put the part or drill a hole. 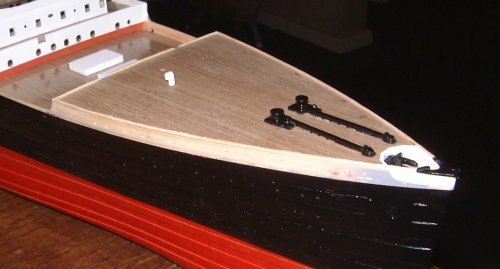 Here's a plan view of the bow anchor. As you can see, the hole in the well deck is virtually covered. Gluing the anchor together was a bit tricky, but went OK after the paint had been scraped off and the end of the shank files flat so I got a decent join to glue. Viscous (thick) Superglue did the trick. 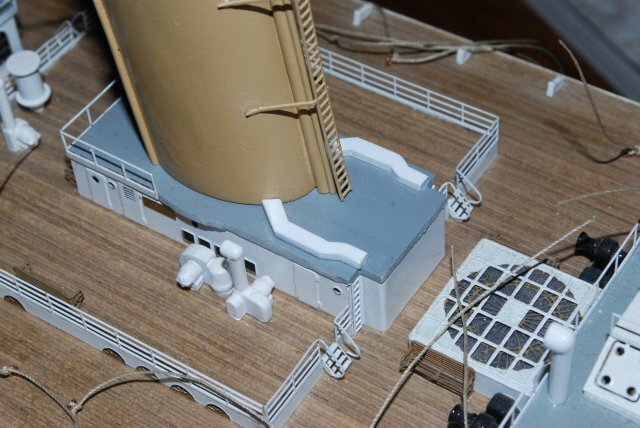 Here is a view of the completed forecastle. Fitted at week 92, after the funnels are fitted, here are the trunks glued in place. Note : The Bow Bits, painted black on my model should actually be painted white. Thanks to Michael in Aussie, and a slap on the wrist for Amati. 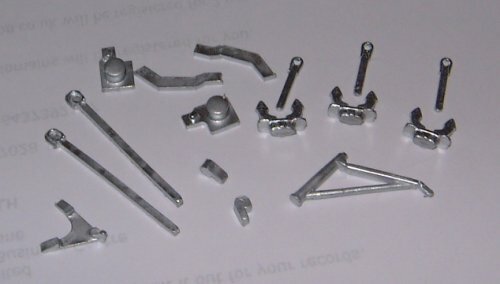 Try to think ahead - It may make life easier to save parts until later. It's easier to fit a small part against a large part than visa versa.